Arrived at Nishi Wonhanji, an extensive complex of temples and buildings to serve the Jodo Shinsu Pure Land sect of Buddhism. As you walk through the gates there is a collection box for earthquake victim relief. Entering through the Amidado gate you are immediately confronted with the great hall of the Amida Buddha. 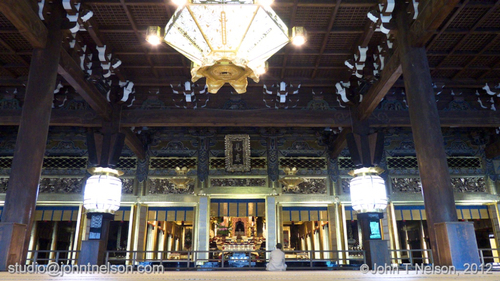 To the left is the larger Goeido hall where I spent a half hour in meditative prayer. Approaching each of these halls I couldn’t help but be struck by the age and massiveness of the wood beams and planking. This is the largest wooden structure in Kyoto and was built in the 13th century. As in most Japanese spaces, to enter the hall you must remove your shoes. The halls are floored with REAL tatami mats. There are also gardens, carefully manicured trees, what appears to be an heirloom botanical library, and a large fountain in the shape of a lotus. At 16:00 hours, one of the temple bells is rung. Sadly, I was unable to video tape this impressive event or record the lovely sound of that temple bell.